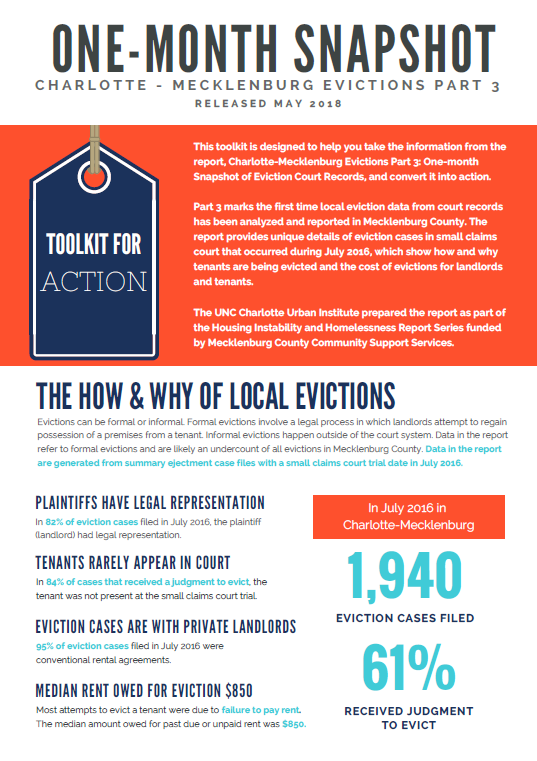 The UNC Charlotte Urban Institute and Mecklenburg County Community Support Services released Charlotte-Mecklenburg Evictions Part 3: One-month Snapshot of Eviction Court Records Wednesday, May 23, 2018. 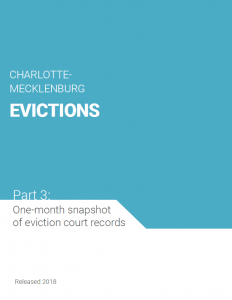 Evictions Part 3: One-Month Snapshot of Eviction Court Records is the final report in a series on evictions in Charlotte-Mecklenburg. This report focuses on how and why tenants are evicted and the cost of evictions for landlords and tenants. This series marks the first time local eviction data from court records have been analyzed and reported. This report provides unique details of eviction cases in small claims court during the month of July 2016. When an eviction case is filed, it starts the process of a landlord attempting to formally evict a tenant. There is currently no electronically available individual case level data on local evictions. To obtain data for one month of evictions, a team of researchers and trained volunteers manually scanned and entered data from public court records, spanning multiple months. The court documents used for analysis are associated with key points in the formal eviction process. A copy of each form is including in the appendix of the report. Evictions can be formal or informal. Formal evictions involve a legal process in which landlords attempt to regain possession of a premises from a tenant. Informal evictions happen outside of the court system which can include when a landlord increases rent resulting in tenant displacement. Data in the report refer to formal evictions and are likely an undercount of all evictions in Mecklenburg County. In July 2016, there were 1,940 eviction cases filed in Charlotte-Mecklenburg and that are included in this study. Most attempts to evict a tenant were due to failure to pay rent. In 82% of eviction cases filed, the landlord (or plaintiff) had legal representation. In 84% of cases that received a judgment to evict, the tenant was not present at the small claims court trial. 95% of eviction cases filed were conventional rental agreements. 92% of eviction cases filed were by corporations. 46 landlords (plaintiffs) had 10 or more of the eviction case filings, accounting for 45% of all eviction cases filed. The median amount owed for past due and unpaid rent of all eviction filings was $850. The median amount owed for past due and unpaid rent in public housing units was $282 and $832 in Section 8 units. The cost of evictions for families, neighborhoods and the community extends beyond what occurs within the court system. Evictions impact the well-being of families and children, create residential instability and perpetuate patterns that lead to disparity rather than upward mobility. Support the creation of more affordable housing, pathways to increased income & eviction prevention assistance to stabilize families and neighborhoods. Increase access to legal representation and education regarding the eviction process to level the playing field for tenants. Invite private landlords and corporations to the table with tenants and community decision-makers to creating sustainable solutions that support tenants and landlords. Mecklenburg County Community Support Services developed a toolkit to complement the report. The toolkit provides short-term and long-term strategies to make a difference in the areas listed above through policy and systems change. Some solutions have been evaluated and proven effective while others offer new, innovative practices that can be integrated into existing local programs and systems. Political will exists when there is a sufficient set of decision-makers who share a common understanding of a particular problem and are committed to supporting a commonly perceived, potentially effective policy solution. Decision-makers in Mecklenburg County have the opportunity to address the consequences of the past or perpetuate and pay for mistakes in the future. Are you a landlord? Tenant? Funder? Housing Provider? Concerned Citizen? What role will you play in shaping the future of housing in the community? We can start by asking that question of ourselves and others: So, what role will you play? This post is co-authored by Courtney Morton and Ashley Williams Clark.